If the buttons on the transmitter are inoperable and the operation indicator light does not fl ash, the battery may be dead. Make sure the battery is installed correctly. Battery leakage could occur if it is not installed correctly. When replacing the battery, be careful not to touch any of the internal circuitry and electrical terminals, bend the electrical terminals, or get dirt in the transmitter as the transmitter could be damaged. There is the danger of explosion if the battery is not correctly replaced. Dispose of used batteries according to the following instructions. Insulate the plus and minus terminals of the battery using cellophane or equivalent tape. Never throw the battery into fi re or water. Replace only with the same type battery (CR2025 or equivalent). The KEY indicator light (green) fl ashes in the instrument cluster for about 30 seconds after the engine is turned off. The system does not operate and the operation indicator light on the transmitter does not fl ash when the buttons are pressed. The system's operational range is reduced. Replacing the battery at an Authorised Mazda Repairer is recommended to prevent damage to the key. 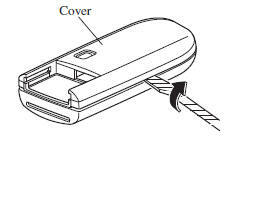 If replacing the battery by yourself, follow the instruction below. Press the knob and pull out the auxiliary key. 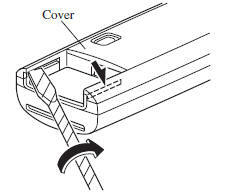 Twist a tape-wrapped fl athead screwdriver in the direction of the arrow and open the cover slightly. 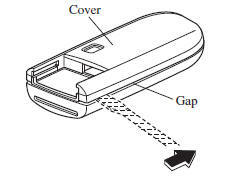 Insert the tape-wrapped fl athead screwdriver into the gap and slide it in the direction of the arrow. 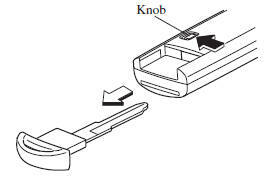 Twist the fl athead screwdriver in the direction of the arrow and remove the cover. Remove the battery cap, then remove the battery. 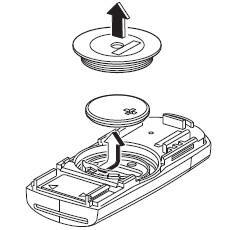 Insert a new battery with the positive pole facing up, and then cover the battery with the battery cap. Be careful not to allow the rubber ring shown in the fi gure to be scratched or damaged. If the rubber ring detaches, reattach it before inserting a new battery.